Everyone needs a tote bag! Help spread the word about BikeLights and get yourselves a beautiful and useful item at the same time. 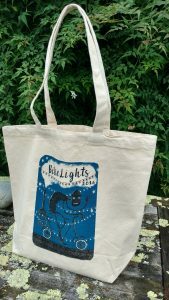 Lovely thick cotton bags with Jago’s brilliant design, on sale in Wadebridge Bikes and Elixir Health Foods, £4 each.